Show your state pride with our Alabama State Flags. The Alabma state flag was adopted in 1895 and patterned after the Confederate battle flag features a Crimson cross of St. Andrew on a field of white. The bars of the cross must be at least six inches wide, which makes it difficult to produce small flags that adhere to the design's requirements. The state flag of Alabama is more than one hundred years old and it reflects the state’s Spanish colonial history. The original flag of designed by a group of Montgomery women, the "Secession Convention Flag" which became Alabama's first official flag was removed after only one month due to damage by severe weather. Show your love for your state with our 100% made in the USA, Alabama flags that are available in a range of popular sizes including 3’x5’, 4’x6’, 5’x8’ 6’x10’ and 8’ x12’. Choose from indoor and outdoor flags to match your everyday flag needs. We also have indoor flag kits which have everything you may need to set up a dazzling flag display. Shop from our complete line of Alabama State Flags right away and get the best prices, quick shipping, and much more! 100% customer satisfaction guaranteed! Our Alabama state flags make perfect symbols of patriotism and craftsmanship. Made from superior quality materials like 200 Denier Nylon or polyester, our flags are finished with heading and grommets to ensure easy mounting. The UV resistant Dupont ink imprints will retain its brilliance and colorfastness for a very long time. Be it for state parades, trade events, sports days, national events, and more, our flags will never fail to grab attention. 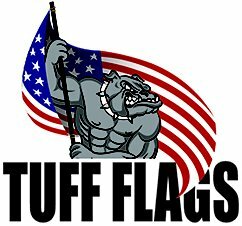 If you are looking for high quality Alabama indoor or outdoor flags, look no further than Tuff Flags. 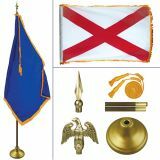 We have even Alabama Indoor Flag Kits complete with ornaments, poles, gold colored tassels, and cord. 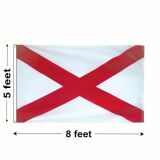 Browse our collection Alabama State Flags and choose a size that matches your need. 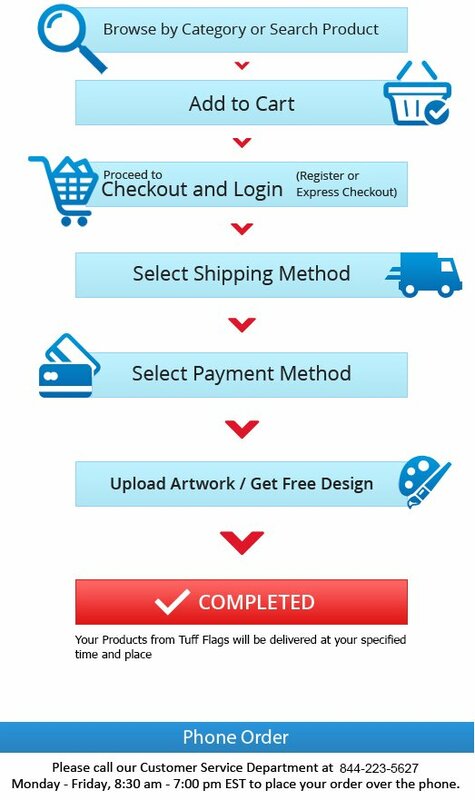 Should you need any assistance, just call us at our toll free number (888) 287-3524 or email us at customercare@tuffflags.com.